The name or term "Micronauts" refers to more than one character or idea. For a list of other meanings, see Micronauts (disambiguation). "What should we do next? Something good? Something bad? Bit of both?" 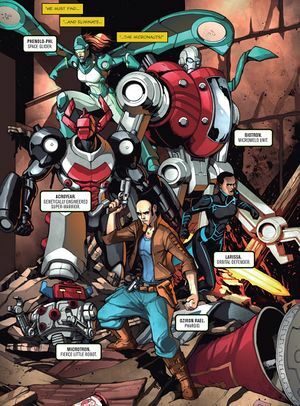 The Micronauts are a ragtag team of heroes from Microspace. Originally a small-time crew of smugglers aboard their ship, the Heliopolis, they found themselves drawn into the conflict between Baron Daegon's Ministry of Science and Baron Karza's Ministry of Defense. They are now stuck on a strange, mysterious world populated by giant creatures and even bigger machines. While flying through the Cloud, the Micronauts were attacked by Reptos, a race of beings previously thought destroyed by the cloud. Before the Reptos could destroy the Heliopolis, the crew was saved by the mysterious Time Traveller. This page was last edited on 26 April 2018, at 17:27.